At the end of the last century, Johnstown, Pennsylvania was a booming coal-and-steel town filled with hardworking families striving for a piece of the nation's burgeoning industrial prosperity. In the mountains above Johnstown, an old earth dam had been hastily rebuilt to create a lake for an exclusive summer resort patronized by the tycoons of that same industrial prosperity, among them Andrew Carnegie, Henry Clak Frick, and Andrew Mellon. Despite repeated warnings of possible danger, nothing was more about the dam. Then came May 31, 1889, when the dam burst, sending a wall of water thundering down the mountain, smashing through Johsntown, and killing more than 2,000 people. It was a tragedy that became a national scandal. I've been itching to listen to another nonfiction audiobook, and with all the talk of new Gilmore Girls episodes hitting Netflix soonish, I really wanted an audiobook read by Edward Herrmann. 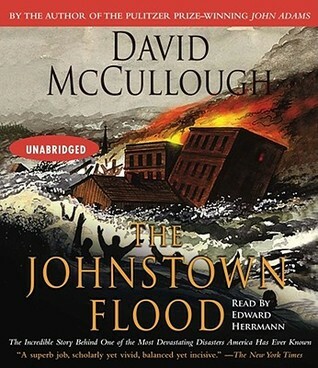 Which naturally led me back to David McCullough and finally to The Johnstown Flood. Yes. That's how my reading mind works when I'm not distracted by "OOO! Shiny, pretty cover!" As narratives go, McCullough knows how to tell a story. It's a history lesson in the context of the lives of the people in Johnstown, Pennsylvania. He sets a stage, paints a picture, and then the catastrophe hits. Only through providing context do you full understand the impact the the flood had on the area and why it was so controversial. And it was. Pennsylvania "big-wigs" want a place to summer and get back to nature. "Big-wigs" build a dam to create a lake that they can fish in during the summer. Dam isn't stable. Down comes the rain and tragedy strikes. Lives were lost that shouldn't have been lost. It's a story about progress, industrialization, a flawed social hierarchy, and a beautiful town on the rise that was brutally washed away. A fellow librarian, and history buff, said she made the trek to Johnstown on a family vacation. While the kids weren't initially interested, they couldn't help but spout information they had gleaned from this historical markers they passed along the way. That reminded me a lot of my family vacations which almost always include a stop at a historical monument of some sort. I don't remember all of the details that I read on plaques and in museums, but I remember feeling thankful that my family respected history enough to take time, to embrace it and share it. Hopefully one day I'll find my way to Johnstown - maybe on the same trip that I make my way back to Kitty Hawk to revisit the awesomeness of what the Wright brothers accomplished.